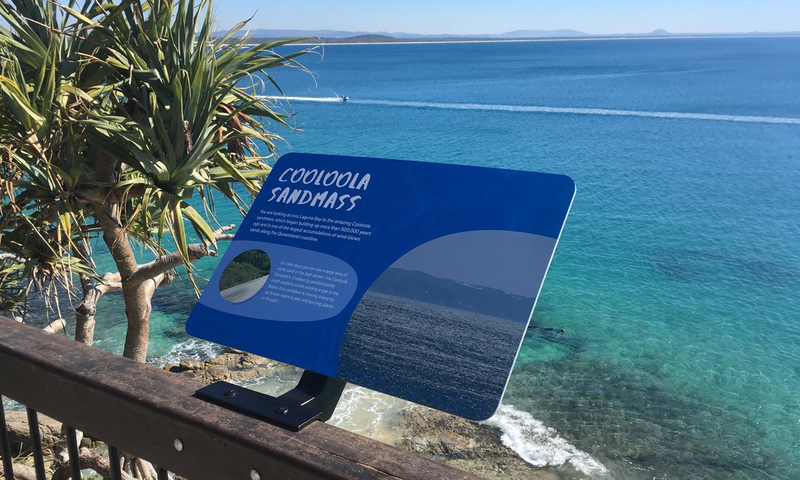 In early 2017 we completed the Noosa National Park Coastal Walking Track signage and wayfinding project for the Queensland Parks and Wildlife Service. The project saw the upgrade of signage within the park to incorporate local Indigenous Kabi Kabi knowledge and understanding of the site. The extensive interpretive and wayfinding project required close consultation with the project stakeholders and has an expected 15 year lifespan. The project scope included wayfinding, orientation, interpretation and art within the national park. A new graphic identity was created to ensure new (kabi Kabi) content and pre-existing content worked cohesively together to complement and enhance each of the narratives, and at the same time be distinct from one another. Kabi Kabi interpretation was developed by a local Indigenous curator in partnership with the local Indigenous community and the QPWS project curator. A local Kabi Kabi artist was contracted to create illustrations for the signage.